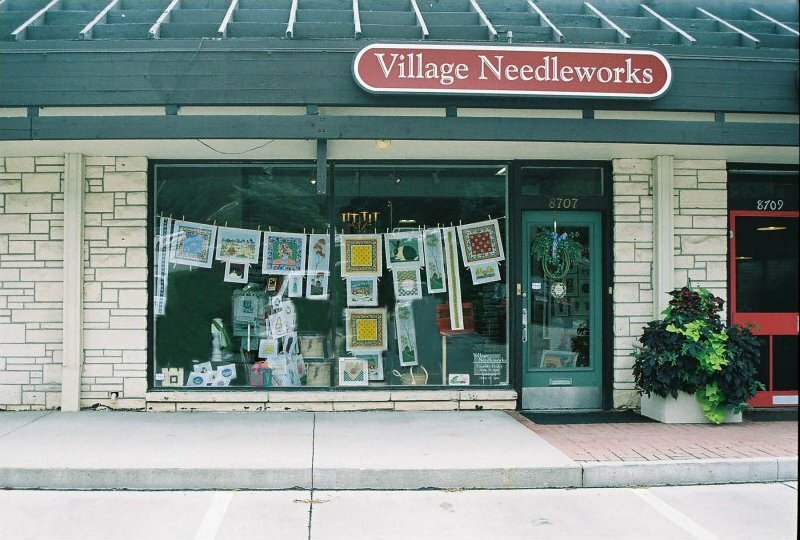 Village Needleworks was purchased by Mary de Souza in February 2007. The bay it occupies, at Countryside Village, is the same one where two previous needlepoint shops existed. I guess you could say it's destined for needlepoint. Previous to her needlepoint life, Mary worked as an educator with the Nebraska Cooperative Extension Service for thirteen years, helped her husband, Euclid, build a successful urology practice and raised three daughters and a son. Always ready for a challenge, the opportunity presented itself to continue the needlepoint tradition in Omaha. Mary was exposed to needlepoint the summer before her senior year in college while a counselor at a summer camp in Colorado. Self-taught, she tackled many projects until children began demanding her attention. Years later, while sitting at numerous tennis lessons and tournaments, she realized she could watch tennis and be productive at the same time. It's been all about needlepoint since then. Judy was born, raised and received her education in New York State. She worked as a labor and delivery nurse and taught natural child birth classes upon graduation from nursing school. Her husband served in the USAF as a navigator radar bombardier and missile man. After living in New York, Texas, California, and Virginia the couple settled in Omaha and purchased The Village Book and Stationery which they ran for twenty five years while raising their five children. Upon the sale of the store Judy attended horticulture classes at Metropolitan Community college and worked three seasons at Earl May over seeing the care of the perennial plants and designing clients flower gardens. The couple recently celebrated their 50th anniversary. About ten years ago Judy took up needlepoint and while she does not consider herself an accomplished needle pointer she does it with great enthusiasm. Her projects include chairs and stockings for the grandchildren, pillows, benches and footstools. Her favorite projects are the ones which depict events and memories in her life and include framed pictures of her family home, circa 1800, and the church established by her ancestors in 1856, pictures of family vacations needle pointed free style using left over fibers, and a hat band and name tag for garden club meetings. Bargello is her newest love and she is frantically attempting to finish numerous painted canvas projects so she can pursue this interest. She enjoys working at the shop because it is a happy and creative atmosphere and it is interesting to see the projects which customers are working on. The artistry of what can be accomplished with canvas and yarn is never ending and so each day brings something new. Peggy was born and raised in Clarinda, Iowa. She met hr husband while attending Northwest Missouri State College and they married during their senior year. After graduation they moved to Omaha while husband, Don, attended Creighton Law School. During this time Peggy worked at Omaha Nation Bank and they rented their apartment from Father Flanagan. Don began his law career in North Platte, Nebraska and made it their home for 44 years. Peggy worked in Don’s firm as a secretary and bookkeeper. Peggy, a widow, has two daughters, a son, and seven grandchildren. Peggy’s needlepoint career began 40 years ago, but claims she’s learning something new about needlepoint each time she comes to work.